Hello my felt loving friends! 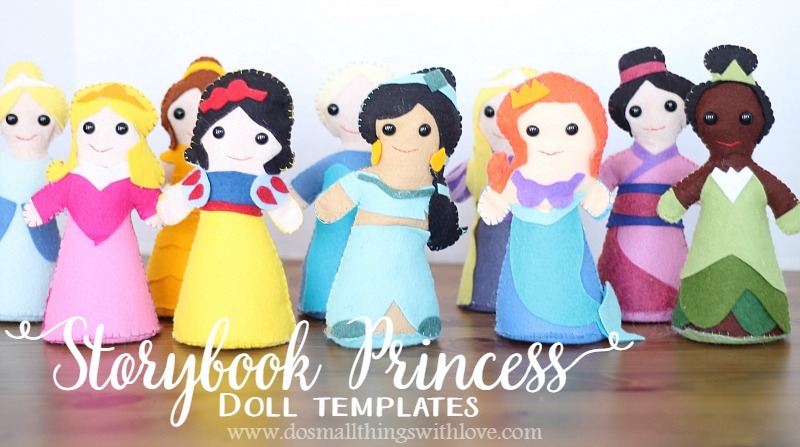 I have yet another felt template project for you–this time it’s Storybook Princess Doll Templates. 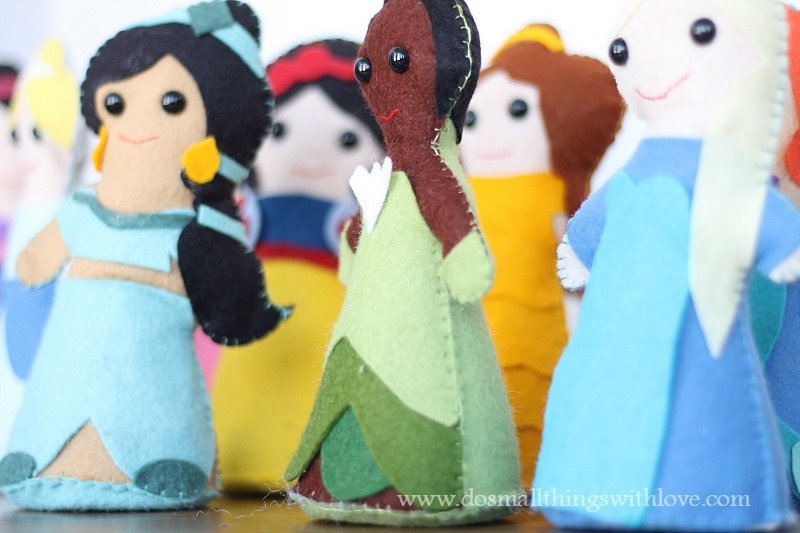 You know them, you love them, and if you have a little girl like I do, they are a part of your everyday life–so why not make your own adorable felt dolls of each storybook princess? My set of these storybook princess dolls has only been completed for a couple of days now and they already have been well-used and well-played with! Now, as you can see, these little princess dolls are not perfect–and certainly not real to life. 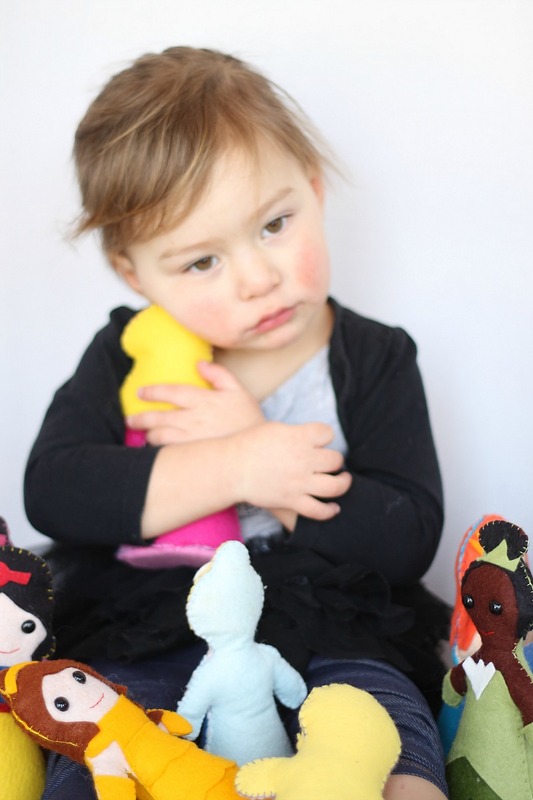 These are intended to be toys–not portraits of these princesses. Also, as you can see, I didn’t always get the eyes in exactly the same spot and sometimes I didn’t get very much fluff into the arms–and yet my little Bernadette loves these princesses…and is currently sleeping with all of them. Be warned, this pattern is a little tricky. Let me know if you need any help along the way! 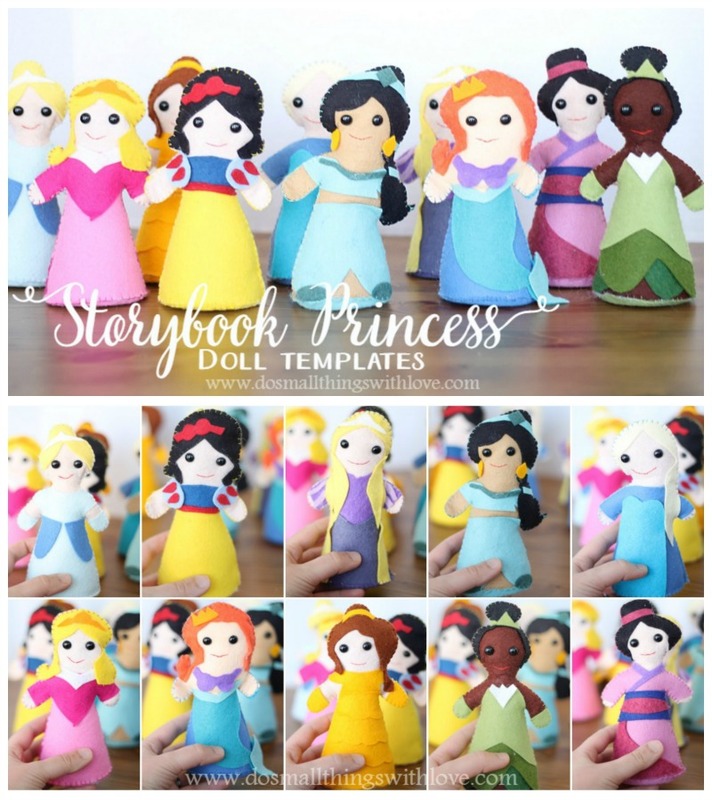 I am offering all 10 storybook princess doll templates as a bundle in etsy shoppe for just $5! To grab the templates and get crafting, head HERE! And, here is a closer look at each doll. Isn’t Snow White cute? Here she is from the front, back and bottom. Since they each have a flat base they stand up independently. Each is also stuffed with polyfil so it is wonderfully huggable. Which is exactly what my little Bernadette likes to do. She carries her princesses around in a bag and sleeps with all of my some night. 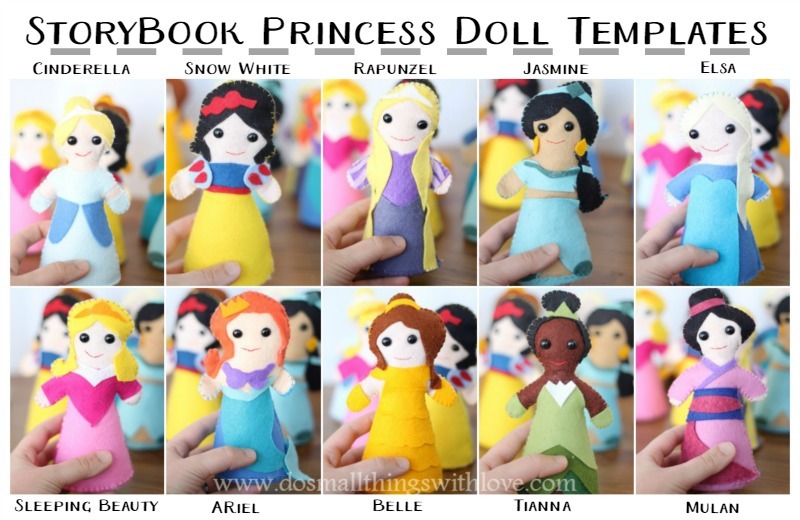 These storybook princess dolls take a little bit of work but can you just imagine how happy they will make some little girl? What a great handmade birthday or Christmas gift, right? Okay, no pressure, but the future happiness of your beloved little girl is probably hinging on whether or not you make her these dolls…maybe. If that little guilt-trip worked, you can once again get the template HERE. In all seriousness, I’m just so thankful you stopped by. May the rest of your day be simply magical! Nancy, my co-worker bought the templates to make for her little girl and I’m going to help her! We’re very excited!! Nancy! This are so sweet! You are so talented. 🙂 Off to pin!